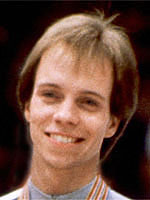 Scott Hamilton was the best men's individual skater on the international circuit during the early 1980's and his triumph at the 1984 Sarajevo Games was a well deserved climax to a highly successful career. In one way, Hamilton's story is one of triumph in the face of adversity, as the American spent the early part of his life struggling with a mysterious condition that prevented his normal growth. Doctors first thought it might be Schwachmann's disease, which paralyses the functioning of the intestine, but the experts couldn't agree. The fact remained that he just wasn't growing. Adopted and brought up by two teachers from the University of Bowling Green near Ohio, the young Hamilton became passionate about figure skating at the age of nine. At first his enthusiasm tended to get the better of him, and he often hit the ice rather harder than most aspiring ice skaters would expect to. But despite the knocks, Hamilton persisted and was soon showing signs of real promise. He was coached first by Frenchman Pierre Brunet, double Olympic pairs champion with his wife Andree in 1928 and 1932, before being taken on by another celebrated coach, Carlo Fassi, who had guided Peggy Fleming to gold in 1968. Growing to his maximum height of 1.60m and weighing only 50kg his low centre of gravity and lightness helped him develop first-rate jumping skills. He was all for lacing the normally rigid programmes with touches of humour, and his dynamic triples gave the performances the necessary gravitas to keep the judges on message. His first Olympic participation was at the Lake Placid Games of 1980, where he was given the honour of carrying the American flag at the opening ceremony. After finishing fifth at his home Games, he was then unbeaten until 1984, the year of his Olympic title and fourth world championship. Hamilton then switched to the professional circuit, and also began working as a television commentator. In 1997 he was diagnosed with testicular cancer, and he underwent surgery and later chemotherapy in June of the same year. Remarkably, he was back on the ice within a few months, generating a wave of admiration among his supporters for his courage and determination. He had another scare in November 2004 when he was diagnosed with a benign brain tumour after complaining of bad vision, but thankfully it was not life threatening.